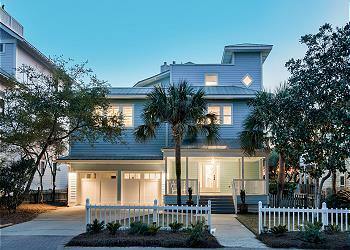 DETAILS: A stunning new construction home just one block from the beach! This beautiful three-story Dune Allen property features five bedrooms, six bathrooms, an expansive outdoor oasis, and gorgeous coastal views. Experience the amazing first impression of 68 Baird Road, with the bright and welcoming exterior façade and spacious covered porches. Through the front door, the main level offers an open-layout floorplan with abundant natural light and a wonderful flow between the kitchen, dining, and living areas. The gourmet kitchen boasts incredible custom cabinetry, top-of-the-line stainless steel appliances, and a large gas range—a perfect place to prepare and share your favorite meals. The nearby dining area offers ample seating, with additional seating at the large kitchen island. In the living area, guests can relax after a long day of fun and sun. This level also offers a lavish master suite, which features a comfortable king bed and en suite bathroom with a glass-front shower, separate soaking tub, and dual vanities. On the second level are two luxurious king bed guestrooms, each offering a private bathroom with a glass-front shower and single vanity. The third bedroom on this floor is a bunk room with two custom, built-in twin-over-twin bunk beds. This room also offers a private bathroom with a shower/tub combo—a great space for the younger guests in your group! The third level features an additional living room with a wet bar and wine refrigerator, a loft bunk area with a custom, built-in twin-over-twin bunk bed, and a queen sleeper sofa. A well-appointed king bed guestroom and a shared bathroom with a shower/tub combo complete the third-floor layout. Guests in this incredible home will enjoy the expansive 800 square feet of covered porches, which offer exquisite emerald coast views. The home’s large, private outdoor oasis features spacious grassy areas, a firepit, and a large pool, making it an ideal place to splash in the refreshing waters and soak up the Florida sunshine. The sugar white sand beach is just steps away, and five custom 360 Blue adult beachcruiser bikes invite guests to experience 30A the best way—on a breezy, peaceful ride through our captivating coastal towns. This spectacular, brand new luxury home is ready to make your next 30A getaway the most memorable vacation yet. Don’t miss out on this incredible property—book your dream getaway by contacting 360 Blue today! 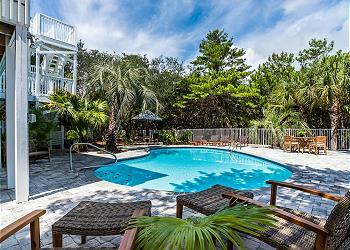 OTHER AMENITIES INCLUDE: 5 adult bikes provided, private pool, fire pit. This property comes with 4 dedicated parking spots. Complete Clean Linen Participant - ALL linens, including comforters laundered upon every checkout. Our family was very comfortable on this home on Baird Road. It was spacious, clean, and well stocked for all our needs. We had fun playing games on the large table in the living area during our rainy days. The beach was close enough we could walk but we also used the golf cart for our beach supplies. The beach is beautiful and the water clear. The pool at the home is nice but the water was cold. It was a little too expensive to heat. We used the fire pit to cook S'mores and warm us during the cool evenings. Dune Allen is a nice area and hope to use 360 Blue for our next rental. 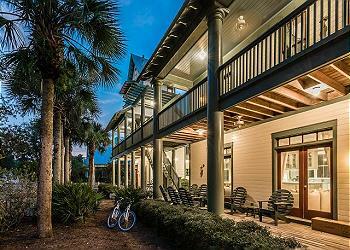 The property at 68 Baird was a wonderful place to stay! It was so well maintained and the staff was so attentive to everything. The home was very comfortable and extremely well maintained! 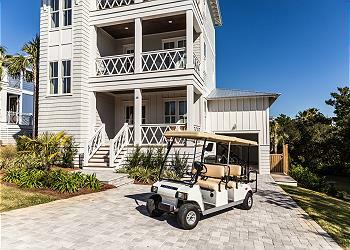 The golf cart made it simple to go to the beach and shops! I would definitely rent from 360 Blue again!! We are so delighted to hear how much you enjoyed your vacation with us in Dune Allen! We are also so thrilled that your experience with 360 Blue was a positive one. We agree that this home is a wonderful option for a fun-filled beach getaway and we look forward to hosting you and your family again soon!